1. Prime your eyes. This enhances the color of your eyeshadow and make it lasts longer. 2. 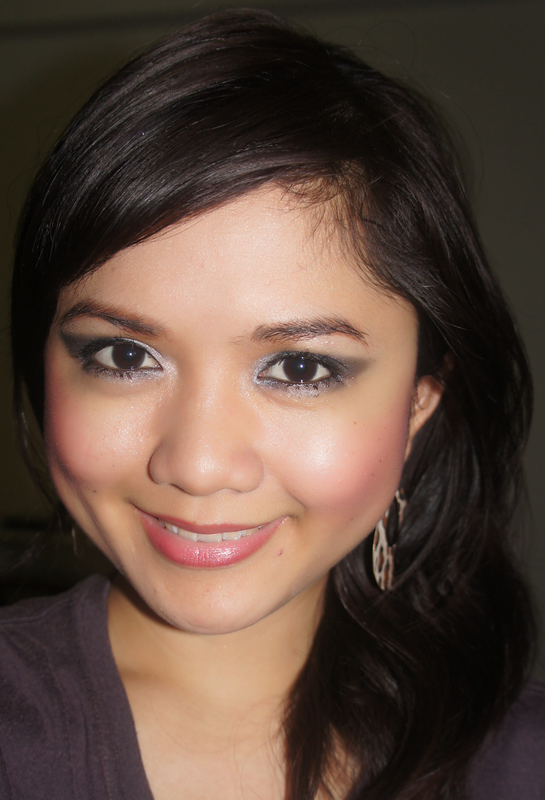 Apply a light gray eyeshadow color on your entire upper eyelids. 3. Apply a matte black eyeshadow on the outer corner of your eyes, away from the center of the upper eyelids. Think of it like drawing a '<' on the right and '>' on the left outer corners of your eyes. 4. Blend the application using your blending brush upwards to the crease area and extend it outwards from the outer corners of your eyes like the photo below. 5. Dab a shimmery black eyeshadow just on the outer corners of your eyes and gently blend it around that area. Check out the difference from the photo in step 4. 5. Apply eyeliner on your upper lash line and on your waterline. Smudge it to get rid of the hard edges. 6. Apply the light gray eyeshadow on the inner corners of your eyes too. This will help widen and brighten up your eyes. 8. Apply a white eyeshadow or highlighter on your brow bone. This is the area just below your brows. This creates an illusion of a lifted brow. 9. Curl your lashes, apply mascara and continue with your usual makeup routine. I would recommend this look for evening parties and shindigs. How about you? Where would you wear this look? Don't be afraid to experiment on your own. Practice, practice and practice to perfect the look. And always remember less is more.